Stardew Valleys blend of pixel charm and gentle pacing makes for an excellent little escape. As a quiet person working in a loud, open-plan office the idea of packing it all to go live on a farm appeals to me greatly. Stardew Valley has given me that opportunity, albeit in a cutesy, pixelated form. It’s very much like a Harvest Moon game. 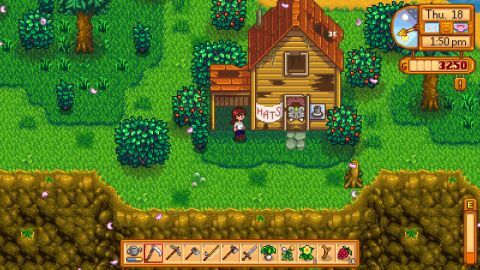 You get your farm up and running by first making a patch of land useable. Then you plant, tend and ultimately sell crops to build up a stable income. What starts off as a few parsnips soon becomes a steady supply of beans and potatoes, and then fancier products like eggs and mayonnaise. You can supplement your earnings by heading out into the forest to forage for berries and leeks, or go fishing. Everything you do consumes energy so you’ll have to keep an eye on how much work you do or you’ll risk collapsing from exhaustion. There’s a town nearby filled with people to befriend and bargain with. If you’re feeling particularly frisky, you can even woo some of them by giving them gifts. Unlike Harvest Moon games where the local town seems to be filled with anime tropes and idiots, Stardew Valley’s residents feel like they’d all actually live there. Everyone is a little eccentric from living in such a small, isolated place, and some even feel depressed and unable to escape. The disheveled Shane with his dirty jumper and four-day stubble is particularly convincing. He spends most of his time drinking in the bar wanting nothing to do with me—behaviour I’d expect from a grown man feeling trapped and trying to hide something. Over time more of the world opens up. Bridges are mended, revealing new areas to explore. After being given a sword I found a mine filled with monsters, which in turn meant I could gather crafting metals with and monster parts to sell. After this I finally found the crafting tab in the menus, where you can craft customisation options. Tucked away between the stats pages and themap, crafting is one of the most fun elements of the game. With the right materials you can make objects such as fence posts and scarecrows, and place them in your lot. Farm customisation is a joy. My lopsided hoeing and patchy groundwork was turned into a professional-looking garden just by adding a stone border and a path. When I finally built a coop and an area for my free range chickens to roam in the whole place really started to come together. As you till the soil you earn experience to improve your skills, though leveling makes little noticeable difference to your proficiency. When you can upgrade your tools later anyway this RPG-like layer seems unnecessary. There are a few other niggles: my mouse cursor would randomly reset itself to the center of the screen during events, and it feels too easy to accidentally miss a festival by not meeting the right conditions to trigger it properly. The menus are a little odd, too. A bit more polish and better signposting would go a long way.